The Lending Club is a “peer-to-peer” online lender, meaning it matches individual investors with borrowers. All borrowers are screened by the Lending Club, and they do oversee the loans and payments; but money changes hands only between individuals directly. The company is publically traded, one of the few online lending companies that offers the public such a close review of its internal workings. They facilitate personal loans, loans for elective medical procedures, and business loans, and have overseen the successful lending of over 15 billion dollars as of the end of 2015. Lending Club isn’t for everyone. Their peer-to-peer loans require a minimum credit score of 600, a relatively high income for the average person, and at least several years of good credit history. While they don’t list any specifics on borrowers’ debt-to-income ratio, assessments of approved borrowers reveal that they usually have a low ratio. Lending Club facilitates loans between $1,000 and $40,000, and the loan durations are a maximum of five years. The good news is that the loan process is usually speedy. After being approved, Lending Club provides loan options for the borrower to choose from. After choosing, the lender will be contacted for approval. If they choose to fund the loan, the borrower will receive the funds in under a week. According to Lending Club, less than 1% of the loans through their services don’t continue on past this stage. The fees can add up, but Lending Club doesn’t have any physical locations, so their overhead isn’t as high as it could be. The origination fee is between one and six percent, and late fees are either 5% of payment due, or $15, whichever is greater. Unsuccessful payments, or payments made by check, may also incur fees. The APR range is between 5.99% and 35.96% for all borrowers. The main point that most consumers point out is that, for the small crowd of borrowers who do fit into Lending Club’s requirements, there are often better ways to get a loan. A secured personal loan, or even a 0% interest credit card, is likely to be a more affordable option for those with high credit scores and low debt-to-income ratios. While the lending process itself is fast, the approval process to become a borrower can take more time than many other online lenders. Additionally, if your loan isn’t backed within 30 days, you must go through the approval process all over again. 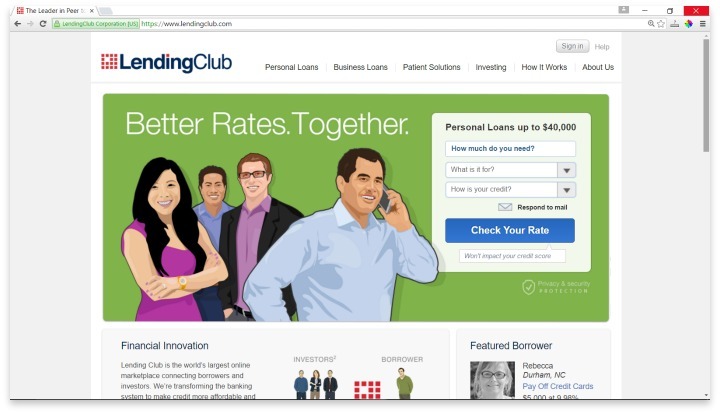 Lending Club is a great option if you are interested in borrowing from private investors rather than establishments. If you fit into the very small pool of acceptable borrowers, Lending Club could be a great option for you, if you are interested in borrowing from private investors rather than establishments. If you are outside of the pool of acceptable borrowers, or if you want the most affordable loan available to you, you’re probably better off looking for a loan elsewhere. The benefits of Lending Club don’t outweigh the fact that, with such a high credit score and income level, a borrower has plenty of better options. Have you had an experience with this company? Please share your Lending Club reviews below.